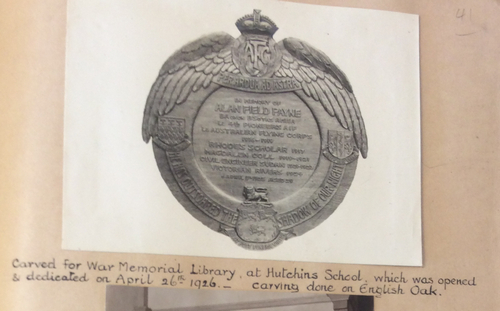 Alan Field Payne memorial tablet presented 1926 to The Hutchins School . Who was Nellie Payne? 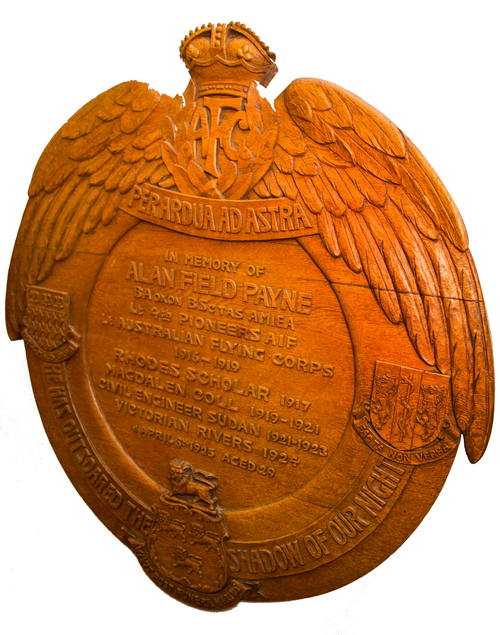 Alan Field Payne memorial tablet. Alan Field Payne memorial tablet as shown in Nellie’s scrapbook. Presented to The Hutchins School, Hobart for the opening of the War Memorial Library in 1926, it now resides in the Hutchins Museum. “Madge Payne, Alan’s sister, also provided a substantial bequest to provide the basis for an Endowment Fund to finance the Alan Field Payne Prize, in memory of her brother. Alan Field Payne (1913) had been an outstanding scholar and sportsman who graduated BSc from the University of Tasmania with high distinctions in trigonometry and applied mechanics and distinctions in surveying and engineering mathematics. During World War One he served in Flanders as a lieutenant, leaving England to join his battalion at the Somme just as the news reached his parents of his selection as Tasmanian Rhodes Scholar for 1917. He drowned while on holiday in Victoria in 1925 but his memory was kept alive by donations from his family, including the beautiful woodcarvings and memorabilia presented by his mother, Ellen Nora Payne. Madge (Marjorie Winifred Terry nee Payne) was herself honoured at a memorial service held at The Hutchins School in July 1976. Then the first major gift to The Hutchins Foundation came from a bequest from Madge’s will – $200,000 and a house in South Hobart; a generous and fitting final contribution from the Payne family, who had given so much to the school over many years”.